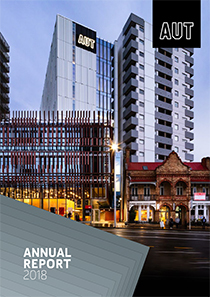 AUT’s main official publications include our strategic plan, annual report and academic calendar. 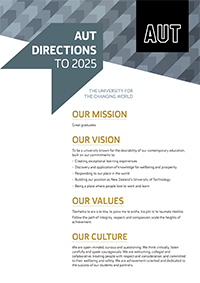 AUT Directions describes the University’s strategic objectives, how AUT intends to allocate its resources, and areas AUT wants to develop or expand. 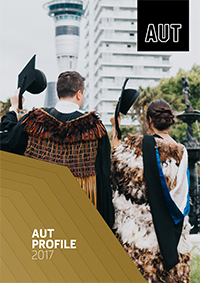 AUT’s annual report sets out the University’s performance and information about key events and issues for the year. It gives information about our services, graduates, research and the positive impacts we make for students, staff and stakeholders. It also features information on AUT's history, facts and figures, campuses, faculties and schools. The Code of Practice (Health, Wellbeing and Fitness to Study) is a supportive framework used when concerns are raised about the Fitness to Study of an AUT student. The Investment Plan outlines AUT’s planned activities over three years. It also demonstrates AUT’s value to Auckland and New Zealand and its contribution to meeting the Government’s priorities for tertiary education. 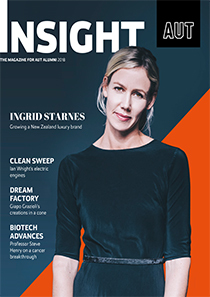 Insight is the magazine for AUT’s alumni. It covers news about research and innovation, achievements and stories about notable alumni around the world, news and events, and more.